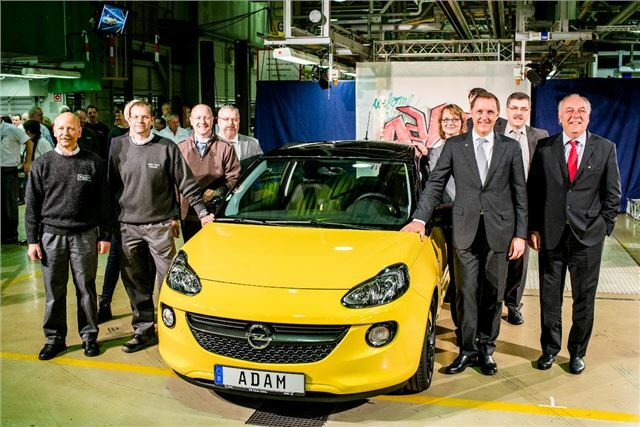 The Vauxhall and Opel Adam commenced production at GM's super-efficient Eisenach factory in Eastern Germany. It will be built alongside the Corsa on a brand new second assembly line. GM has invested €190m in its Eisenach factory in anticipation of the Adam's additional sales - and it looks to introduce this second production line, but it's paying off - more than 16,000 orders have been before the Adam's official on-sale date of 19 January. Adam's production line needs to be flexible. The car is available with 61,000 exterior variations and 82,000 different interior permutations. And it was this flexibility, said Deputy Chairman of Opel/Vauxhall’s Management Board, Dr. Thomas Sedran, that had posed so many challenges for planning, logistics and manufacturing at Eisenach.